I stole this look from the J. Crew catalog. If that's a crime, then sue me! I know a lot of bloggers are criticized for being "unoriginal" and copying from the J. Crew catalog (aka "style guide" as J. Crew likes to call it) but if something looks good, why not copy? I found the J. Crew boy shirt in "snow cat" at my local J. Crew store for a mere $17 after all discounts. Now that was a steal! This isn't normally the type of print I would gravitate to, but for the price it beckoned me to try something different. 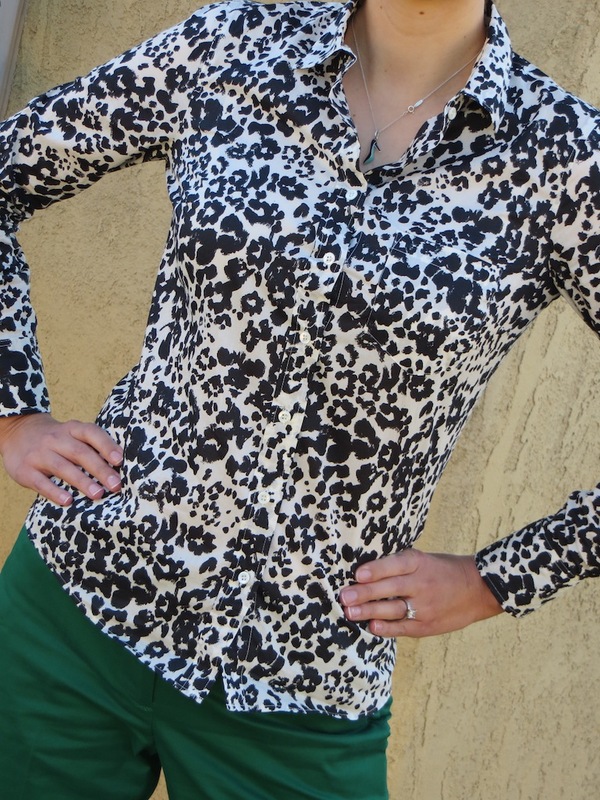 I saw this shirt paired a while back in the catalog (sorry, style guide) with the cafe capri pants in warm jade. Just as a side note, how are these pants considered jade but the color of my pencil skirt in the previous post is also classified as jade? This doesn't add up. Anyway, I love the combination and decided to recreate it which is what you see here. Just on a side note, if you would also like to be a copy cat and need sizing advice on this shirt, it runs big! I found this with all of the J. Crew boy shirts be it in silk or cotton (this one is cotton). I am wearing a 00 here and it fits fine. The cafe capri pants also run a bit big. I am wearing a size 0 here. Hope this helps! 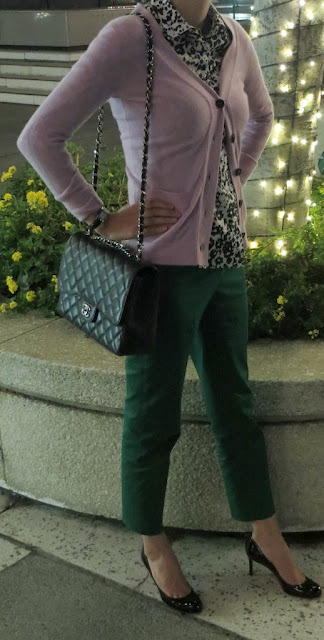 On a side note, below is what I wore out last night with my husband to see the play November by David Mamet. I added a J. Crew lavender cashmere sweater to shield myself from the cold Los Angeles nights which dip all the way into the sixties. Anyway on our way out, while I was in the bathroom, my husband saw Eva Longoria who was most likely there to see her costar on Desperate Housewives Felicity Huffman. I was impressed that my husband was able to report her choice in bag as, "a black Birkin in Togo leather, most likely 35 or 40cm." I have trained my husband well in the identification of handbags! Thanks! We are shirt twins! Yours looks great on your blog! this is so pretty - i love this outfit on you! hope you had a fun night out! Thanks! We had a great night out at the play. I am sorry you missed out on this shirt, phiphi. I will keep my fingers crossed that it pops up in your size!